South Bruce Peninsula has whittled down its budget so there will be no tax levy increase in 2015. Council wrapped up its budget deliberations Thursday, with final approval expected at the Feb. 17 council meeting. "I am so proud of this council because we worked really hard to come back with a 0% without any impact on the people," Mayor Janice Jackson said Sunday. "We didn't cut any services, we increased the roads budget, we doubled the capital equipment reserve fund - we cut a lot of fat." Owen Sound Sun Times Article "South Bruce Peninsula budget at 0%"
A proposal to build a sewer system at Sauble Beach is dead. In a unanimous decision Tuesday, South Bruce Peninsula council decided it will not continue with the project and will not move forward on an environmental study report recommendation. Owen Sound Sun Times Article "Sauble sewer proposal killed"
As a result of Ministry of the Environment opinions, The Town of South Bruce Peninsula has chosen to reopen the Environmental Assessment process. On January 11, 2011, the Town of South Bruce Peninsula Council made a decision to put the project on hold and seek more information. The final proposal submitted by Genivar includes plans to discharge phosphate rich effluent, which has secondary treatment only, into the waters offshore of Sauble Beach. This is not a workable solution since it would double the phosphate contribution already received in the same area from Sauble River discharge. The placing of the outfall pipe possibly in bedrock below the lakebed makes this project economically unsound and the outfall a potential ecosystem disaster that could never be corrected once a system was in place. Since this water and sewer study was started in 1995 no engineering firm has ever found a workable and acceptable way to discharge treated effluent gathered from all of Sauble Beach that did not compromise the ecosystem in some way. Cuesta Planning Consultants have been retained by the Town of South Bruce Peninsula to develop a "Growth Strategy" for Sauble Beach. The Draft Plan proposes high density urban style development requiring water and sewer servicing. 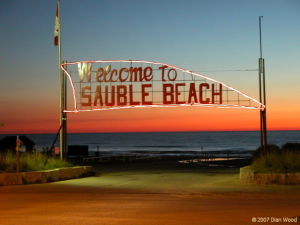 Sauble Beach has a distinct character and should grow at a slow and measured pace. Cuesta and the Town held a public meeting on Saturday, July 17th, 2010 to discuss the draft plan. This page has been visited times since May 10, 2010.